Lou Schulman was one of the founding members of the Skyline Hikers, and this competition in his name is your chance to show off your literary skills. The competition is open to all members who attend the current year’s camp. Stories, poems or skits written about the current year’s hike will be accepted. They may be fact or fiction, including topics such as flora, fauna, camp happenings or any item inspired by this year’s camp. Submissions of 1000 words or less should be typed or printed, double spaced on one side of letter sized paper. Please put your name and address on a separate sheet. The judges will look for such things as use of imagination, appropriate use of language, common sense, grammar, and a good beginning and ending. Winning entries will receive a personalized certificate and will be published in the Skyliner (newsletter) as space permits and posted under the Tales 'n' Trails section on this web site. Deadline for entries is October 15th. Entries will be returned on request only. Dr. A. (Sandy) Sommerville was an avid photographer (read more of his biography below). The trophy was first presented in 1968. Entries must be from the current year’s hikes using this entry form. Images should be clearly marked with the Title, Entrant’s Name and Numbered to correspond with the entry form. Please identify the people in your photos. Personalized certificates will be awarded to first, second, third and honourable mention winners of each category. A Sandy Somerville Trophy will be awarded to the overall winner. Please print your name as you would like it engraved on the trophy – e.g. Bob Smith, Robert T. Smith. The entry deadline is October 1st. All first place winning entries will be kept for in the archives. 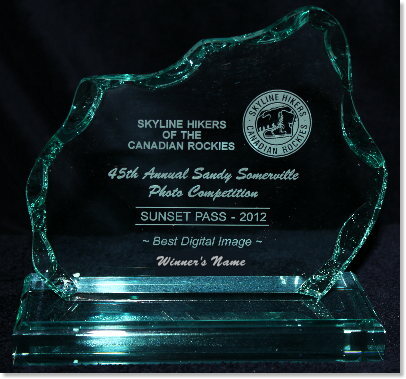 Skyline Hikers reserves the right to use photographic entries for promotional purposes in printed and digital media. Dr. Somerville took his first hike as a Skyliner to the Little Yoho in the summer of 1946. He became a Life Member in the early 1950’s and also served a term as President of the Skyline organization (1952). He was a native of Western Canada, born at Hartney, Manitoba in 1897 receiving his education in Winnipeg. He was in the First World War and later practiced medicine in Eckville and Ponoka. ‘Sandy’ became Assistant Deputy Minister of Health in 1951, and served as Deputy Minister from 1952-1961. Dr. Somerville was the official “Bunion Derby” doctor for the Skyline Hikers for about 15 years. The Hikers owe a debt of gratitude to Sandy who was available for so many years to bandage blisters and to hand out pills and tranquilizers to nervous maidens suffering from “Beetle Fright”. His advice to “Stay Well” at Skyline Hikers’ camps was followed by many. 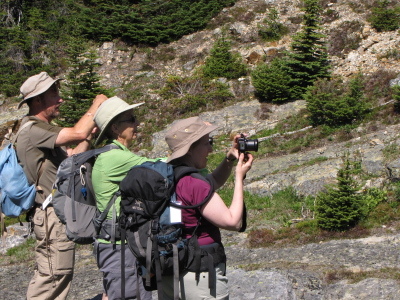 The Somervilles were cause for several happy hiking get-togethers in Manitoba and Pennsylvania where they traveled in October 1961 to see their grandchildren and to take pictures. Sandy continued to be the Hikers’ official doctor until his last hike in 1966. He passed away at the age of 70 in August of 1967. Sandy was an excellent photographer and within a year of his passing, Skyline named the newly inaugurated annual photo competition in his honour.